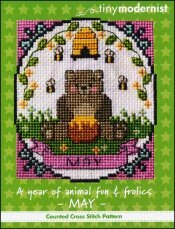 A Year Of Animal Fun & Frolics: May [G1460] - $6.00 : Yarn Tree, Your wholesale source for cross stitch supplies. Cross stitch pattern from Tiny Modernist. Look at this adorable honey bear! The bear is holding a pot of honey with a beehive above him. The bees are buzzing around him. Stitch count 53w x 61h.